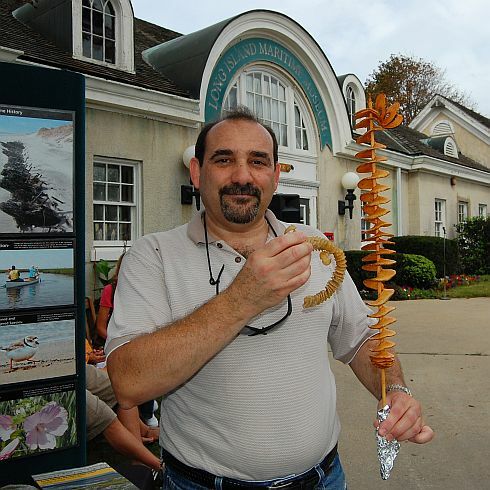 The annual seafood festival at the Long Island Maritime Museum is an over the top event that serves up all kinds of food and brings out all kinds of people. 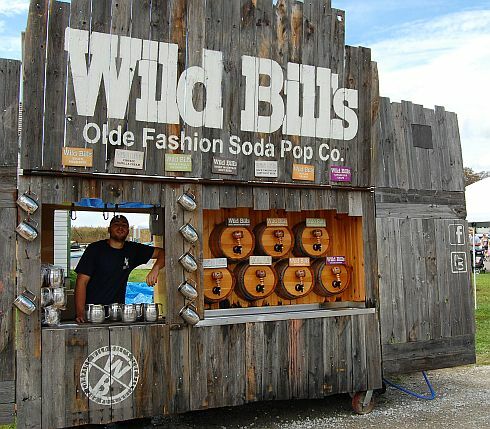 There is live music all day long, vendors selling everything from airbrushed tattoos to jewelry to home improvement services to pony rides. And lots of food, especially seafood. In short, there's no shortage of entertainment here. Hopefully you didn't miss it, but if you did there's always next year. Since the seafood festival draws so many people parking is all but impossible, so the museum sets up 3 off site parking areas from which you can take a shuttle bus. I'm really not a shuttle bus kind of guy, so I parked in a residential area and hiked half a mile to the museum and seafood festival grounds. The first thing I saw were Clam Power tee shirts. 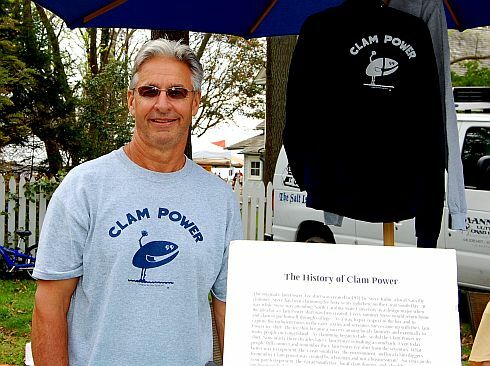 This blast from the past made a comeback a few years ago when Sayville clammer Steve Kuhn, the designer of the Clam Power logo, decided to bring back the shirts that were so popular in the '70s when clamming was a huge industry on the Great South Bay. You can buy shirts directly from Steve via his website clampower.org. A portion of all proceeds are donated to the Nature Conservancy to help their efforts to restore the bay's clam population. Blue Island Shellfish Farms supplied the oysters for my lunch. In spite of the word Farms in their name these particular oysters are a diver harvested, wild variety from Long Island Sound called Naked Cowboy Oysters. I can knock off a dozen oysters with no trouble at all and indeed, although I savored each one, these were gone in seemingly no time at all. The Naked Cowboy Oyster is tender yet firm with a briny, nutty flavor and a somewhat roasty finish that leaves you wanting more. 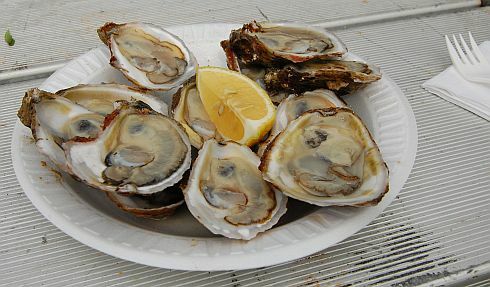 Oysters are very lean and even after eating a dozen of them I'm still hungry. The answer to that is to eat something with a little fat in it. A Tornado Potato is the perfect oyster chaser and a great science lesson at the same time. I'm holding a Tornado Potato in one hand a whelk egg case, sometimes called a Mermaid's Necklace, in the other. They are both constructed the same way: a central core spiral-wrapped with the material of interest. Either potatoes or egg capsules. If you see one of these on the beach pick it up and check it out. Each capsule holds about 100 or so eggs. Look closely and you'll see some very small baby snails that haven’t left the capsules yet. What's a seafood festival without pirates? 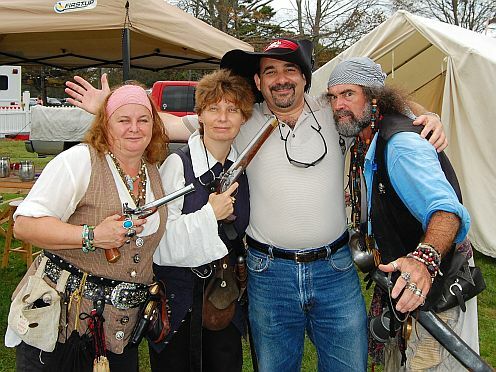 My friends Lucretia Lacy, Marauding Maeve, and Monti Babson of Ye Pyrate Brotherhood persuaded me into posing for a picture with them. How could I refuse? What happened next caught me way off guard. The last thing I expected to see here was the Naked Cowboy. But here he was, in full uniform, with people following him as if he was the Pied Piper. Of course he recognized me immediately and begged for a picture. Well it was a great day at the seafood festival. I was hot and tired and had a long walk ahead of me. To stay cool I had a mug full of Wild Bill's Vintage Vanilla Cream and it was very good. Sugar instead of high fructose corn syrup makes all the difference. 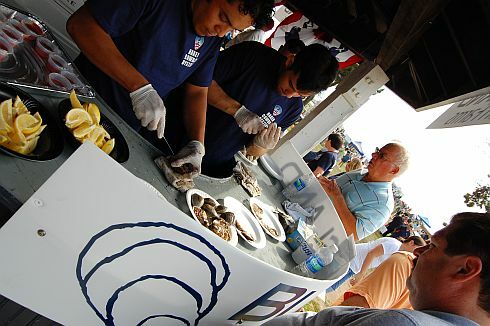 If you like seafood festivals then you'll probably love The Nautical Mile in Freeport or the salty old town of Greenport. Return to Long Island Maritime Museum.